Zebronics recently launched ZEB-VR 3D Virtual Reality headset. This headset is especially targeted towards gamers, education professionals, medical field etc. Read this article to know the features, price and other informations about this 3D headset. Zebronics, India's leading supplier of IT peripherals, Audio/Video and Surveillance products makes history by launching its first major consumer-oriented virtual-reality headset only for Rs. 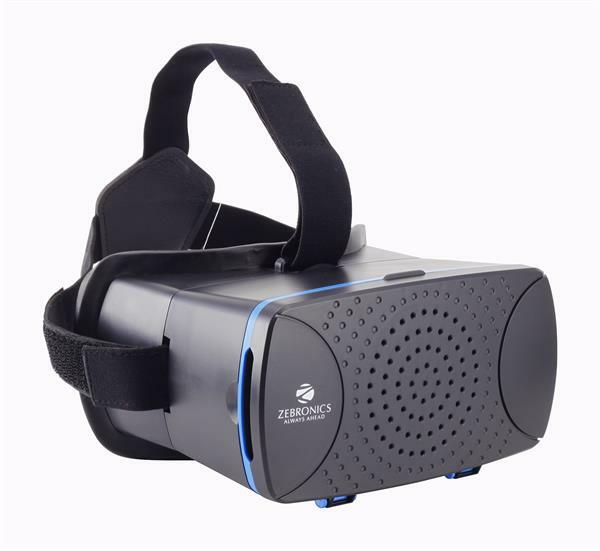 1600/- The VR Headset has applications in fields, like Gaming, education, or in medical field, it opens up a whole new world of reality with ultra immersive experience. Bringing in an immersive experience tracked in a three-dimensional world, ZEB-VR Headsets looks like something from a science fiction movie. Its comes in dark black color with blue rims. Look behind it and you'll find: thick memory foam padding for extra comfort while you play games and watch movies for an extended period. Also a pair of lenses with interpupillary distance and focus adjustment based on the phone display size and the users eye focus comfort. And of course the straps (elastic harness) that hold it all in place with! The smartphone mount in the headset is soft cushioned with magnetic lock for the adjustable front cover, which ensures that your phone is aligned well with lenses. ZEB-VR comes with magnet toggle switch, the ring is made of rare earth metal neodymium and the disc is made of ceramic. This switch enables you to interact with the mobile phone VR application. The Zeb VR is great way to jump into the world of VR gaming and entertainment – best combined with Zebronics ZEB-75WG bluetooth gamepad Gamepad, this combination take the VR gaming experience to a whole new level! Being compatible with the Cardboard amid more VR games available from App store, one could also discover the AR apps with Camera window, indeed ZEB-VR allows you to make the most of it! Weighing less than 103 grams - The Zeb VR is the best virtual reality gadget to buy, which could be easily experienced than explained! Currently it is available at snapdeal.com. Established in 1997 and headquartered at Chennai, Zebronics has one of the industry's widest line-up of products Computers peripherals and Consumer Electronics Totalling to 25 product categories and more than 350 SKUs. Zebronics range of products encompasses Chassis/Cabinets, Speakers, Tablet pc, PC power supply, Portable media players, Headphone, Keyboard & Mouse, LED Monitors, UPS, Gaming Accessories, TV Tuners, Add-on Cards, Computer accessories, Laptop accessories, LED Televisions and Surveillance products. Zebronics has received more than 48 industry awards. Zebronics has 31 Branch offices and over 126 service centres covering all major cities. The Company employs over 900 people and operates through a network of about 12,000 channel partners throughout the country.